I’m sure you’ve heard that you can’t beat the market. It’s the prevailing wisdom—and it’s why passive index funds are more popular than ever. But by that logic, picking stocks is pointless. And actively managed funds? You’ll find no joy there, either, because most managers underperform … and charge you outrageous fees for doing so. That pretty much leaves us with one option: stick all our cash in a low-fee passive fund like the Vanguard Total Stock Market ETF (VTI) and call it a day, right? The truth is, there are literally hundreds of funds out there that have been outperforming the market for a long time. Today, I’m going to show you five of them. And before you ask, no, they aren’t all from one sector. Two are in healthcare and pharmaceuticals: Tekla Life Sciences Investors (HQL) and Tekla Healthcare Investors (HQH), while the John Hancock Financial Opportunities Fund (BTO), as the name implies, is in financials. Elsewhere, the Pimco High Income Fund (PHK) is all about junk bonds, and the Pimco Global StocksPlus & Income Fund (PGP) is diversified across stocks and bonds. Taken together, these funds give you exposure to different asset classes, different sectors and different management teams. 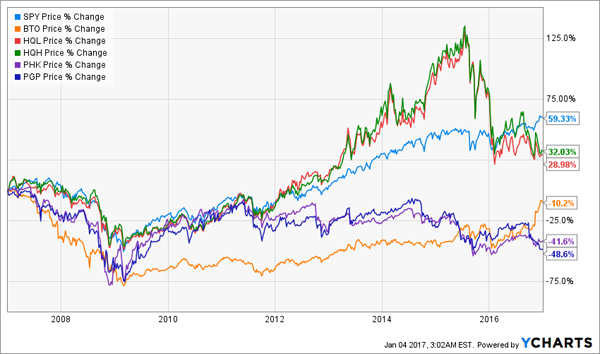 These five funds aren’t just outperforming the S&P 500; they’re also throwing off huge dividends. In fact, you can get an average payout of 9.3% by combining all five into a single portfolio. If we buy these funds according to the allocations above, we will constantly get more cash out of this portfolio, and we can put that cash elsewhere if we feel these funds are getting too expensive, or if we’re worried about a looming downturn. 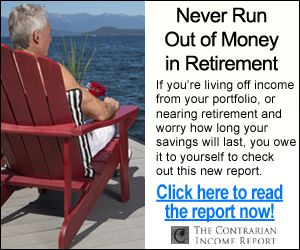 That’s much harder to do with a conventional passive S&P 500 index fund. And if you want to use the portfolio as a passive income stream, that will work, too. Thanks to their combined 9.3% dividend yield, these five funds give you enough cash that you won’t need to sell any shares to keep a strong income stream going. Put $100,000 in them, and you’ll get $775 per month in income. If you want to do that with the S&P 500, you’d need to put in over $400,000—or four times as much capital! The great thing about this is that the longer you hold on to the portfolio, the more you can actively control the assets. If you feel this portfolio is too risky, that’s fine; after two years, you can allocate over 18% of the assets to something ultra-low risk, or just keep it in cash to reduce your overall volatility. After a little more than five years, you can put half of your initial investment into other assets, if you so choose. Again, that’s not possible with a passive index fund. The power is in your hands because of the large distributions these funds provide. Note the small allocations to PGP and PHK. I’ve done this for a reason. Both of these funds trade at a near 45% premium to net asset value (NAV)—meaning you’re actually overpaying for the assets here. However, those premiums are close to the historic averages for these funds; the market almost always pays a big premium because of these funds’ massive outperformance. Surprisingly, the premiums are much less than what they used to be. 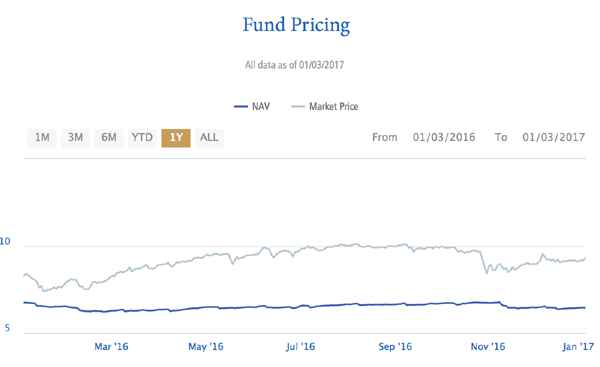 PGP stunned investors earlier this year when its premium to NAV went to 100%—people were actually paying double the fund’s value! PGP has since corrected to a premium closer to its historic average and lower than where it’s been for the last few years, which is the only reason why I would consider it right now. The high premiums on these two funds make me cautious and tell me that any investment in them needs to be small, speculative and offset by much safer holdings. That’s why I’ve limited these funds to a combined 30% of the total portfolio. 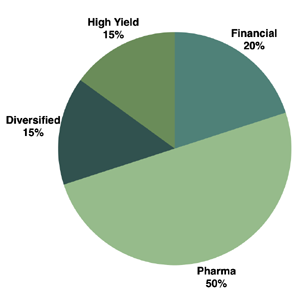 That high pharma allocation tells me this portfolio cannot live alone. 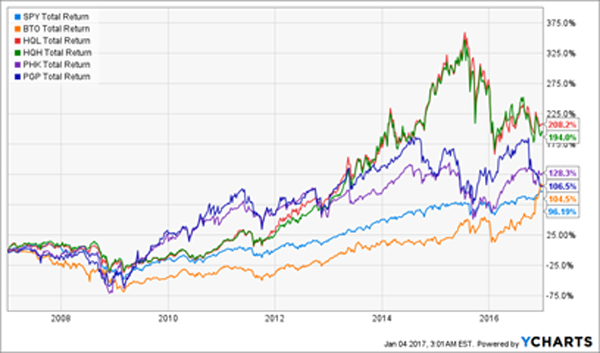 It must be supplemented by other investments that can beat the S&P 500 in the future. Fortunately, there are many funds with more than enough upside to do just that. But where can you find them? I recommend starting with three other picks we’re pounding the table on now. 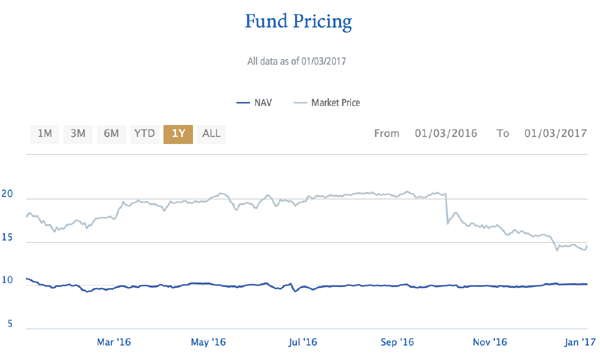 They’re called closed-end funds (CEFs), and our 3 favorites in the space yield 8.2%, 9.1% and even 10.1%! And unlike with PGP and PHK, you won’t have to fork over a premium to get in on them: all three trade at 10% to 15% discounts to NAV. Here’s what that means for you: if the market takes a tumble, those unusual discounts mean these three funds will simply trade flat … and we’ll enjoy those 8.2% to 10.1% yields. But most likely, they’ll jump 10% to 15% and close that hefty discount … and we’ll still collect those fat dividends! These three CEFs form the beating heart of our new 8.0% “No-Withdrawal” retirement portfolio. 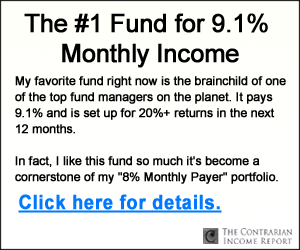 It lets you immediately trigger a $40,000 income stream on just a $500,000 nest egg—and as the name says, you won’t have to sell a single share to keep that cash rolling in. Now I want to give you the names of our 3 favorite CEFs and the other income powerhouses—from bargain-priced real estate investment trusts to preferred shares yielding 8.7% and more—that make up this powerful new portfolio. Simply go right here to get all the details now.